Glow in the dark Solar System - spacekids - space toys, dressing up costumes, kids spacesuits, astronaut food, cool space stuff! 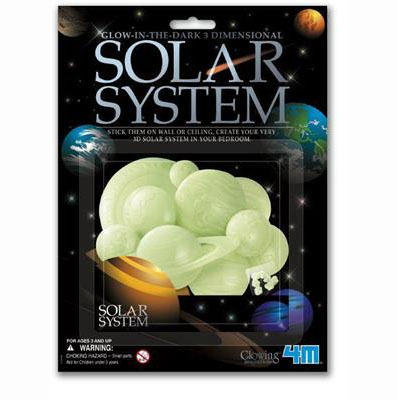 These Glow in the Dark Planets & Sun are molded in beautiful 3 dimensional relief. They come with adhesive and are ready for you to create your own replica of our solar system on your wall or ceiling. Leave the lights on to charge up your solar system. Then turn off the lights and marvel at the glow in the dark effect! Stick them on a wall or ceiling, create your very own 3D solar system in your bedroom. Expose the glow shapes to a light source for a minute. Turn off the light and watch them glow! Contains a full set of Solar System planets and double-sided adhesive tape. Ages 8 years and up.